A deluge of economic data, corporate earnings and Federal Reserve rhetoric is set to descend on the docket in the week ahead. Retail sales reports have generally yielded erratic results, after the partial government shutdown waylaid data collection and processing. 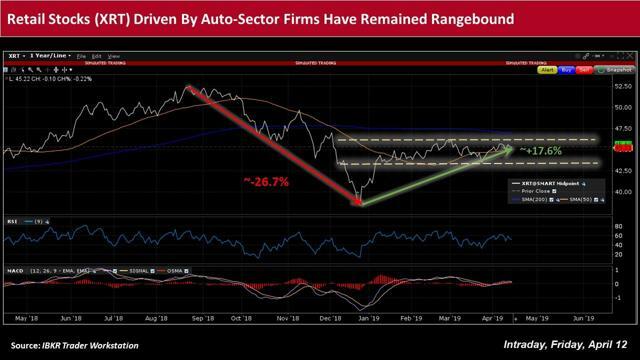 Meanwhile, although consumer sentiment appears to remain squarely in positive territory, certain cracks appear to be seeping through – notably in the auto and housing sectors. Activity in the week ahead is also set to include first quarter earnings updates on a slew of companies, as the season shifts into higher gear. On the monetary policy front, a throng of Fed-speak is once again on tap, following the FOMC's recent decisions to move along a more dovish course. A deluge of economic data, corporate earnings and Federal Reserve rhetoric is set to descend on the docket in the week ahead, as investors continue to contend with a host of global uncertainties. Among the long list of releases, the U.S. Census Bureau and IHS Markit are each scheduled Thursday to unveil fresh retail sales and manufacturing figures, respectively. Retail sales reports have generally yielded erratic results, after the partial government shutdown, which ran from December 22, 2018 through January 25, 2019, waylaid data collection and processing. While February’s decline of 0.2% month-over-month came in weaker-than-expected, sentiment was somewhat bolstered by January’s upward revision from an increase of 0.2% to a rise of 0.7%. The latest gauge also provided the market with some optimism, after the 1.2% drop in December from the previous month, which was accompanied by a downward revision for the October-November period. Jefferies also pointed out that while the preliminary University of Michigan Consumer Sentiment report for April showed a deterioration in the index to 96.9 from 98.4 in the prior month, the index is consistent with the range that it held prior to the steep declines in confidence in January and February, which emanated from the government shutdown and its effects on financial markets. 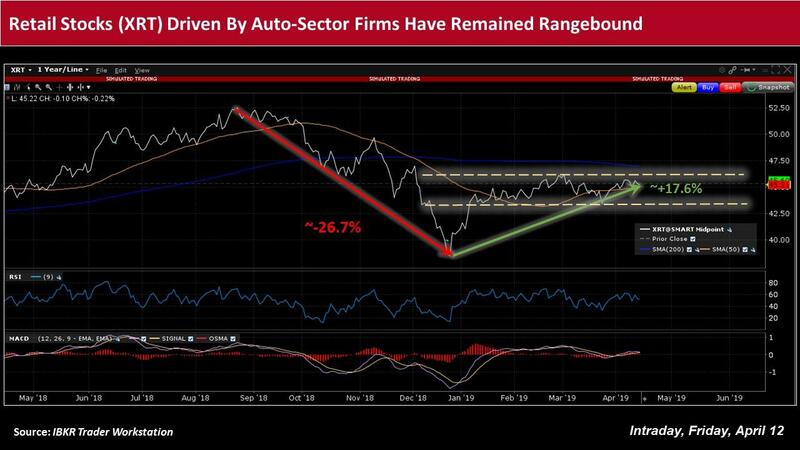 Although consumer sentiment appears to remain squarely in positive territory, certain cracks appear to be seeping through – notably in the auto and housing sectors. The University of Michigan’s surveys of consumers chief economist Richard Curtin characterized the latest gauge of consumer confidence as a “sideways shuffle” – posting an “insignificant decline” in early April following the “small gain” recorded in March. Against this backdrop, the SPDR S&P Retail ETF (NYSEARCA: XRT), which has among its top holdings auto-related stocks Carvana (NYSE: CVNA), CarMax (NYSE: KMX) and Advance Auto Parts (NYSE: AAP), has seen a drop in its value of more than 26.7% from its latest 52-week high set in August 2018 through December 24, 2018. It has since picked up only by around 17.6% from its December low. 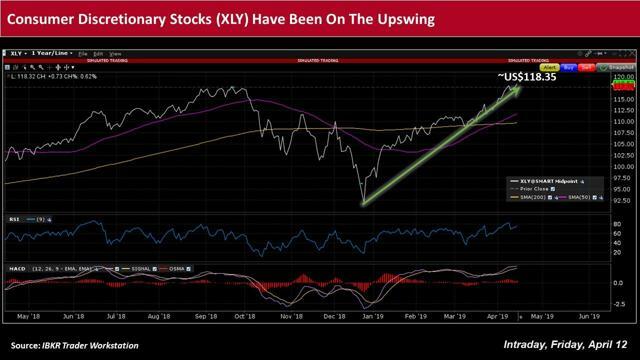 Consumer discretionary sector shares have fared better, with the Consumer Discretionary Select Sector SPDR ETF (NYSEARCA: XLY), which has among its top holdings Amazon.com (NASDAQ: AMZN) and Home Depot (NYSE: HD), having staged a new 52-week high intraday Friday. Elsewhere, investors Thursday will also receive a flash update from the IHS Markit U.S. Manufacturing Purchasing Managers’ Index (PMI) for April after the March reading fell 0.6 month-over-month to 52.4. Chris Williamson, IHS Markit’s chief business economist, said that "further deterioration in the manufacturing PMI suggests the factory sector is acting as an increasing drag on the US economy,” and that the March survey fell in line with the 0.6% fall in the quarterly rate of production. He added that “things may well get worse before they get better, as the forward-looking indicators are a cause for concern. Big banks Goldman Sachs Group (NYSE: GS) and Bank of America (NYSE: BAC) are poised to announce their results in the front part of the week, with Morgan Stanley (NYSE: MS) on the radar for Wednesday, after JPMorgan Chase (NYSE: JPM) and Wells Fargo (NYSE: WFC) each topped market expectations. Other names on the roster include Netflix (NASDAQ: NFLX), PepsiCo (NASDAQ: PEP) and General Electric (NYSE: GE). On the monetary policy front, a throng of Fed-speak is once again on tap, following the Federal Open Market Committee’s (FOMC) recent decisions to maintain the target range for the federal funds rate at 2.25-2.5%, with no plans in 2019 to hike interest rates further, as well as to cease other quantitative tightening measures, including ending its US$4trn balance sheet shrinkage in September. Among other U.S. central bank officials, regional Fed presidents Eric Rosengren, Patrick Harker, James Bullard and Raphael Bostic are each slated to grace their respective podiums across the country. Market participants will likely be looking for any signals about a potential recession on the horizon following the recent inversion of the yield curve. 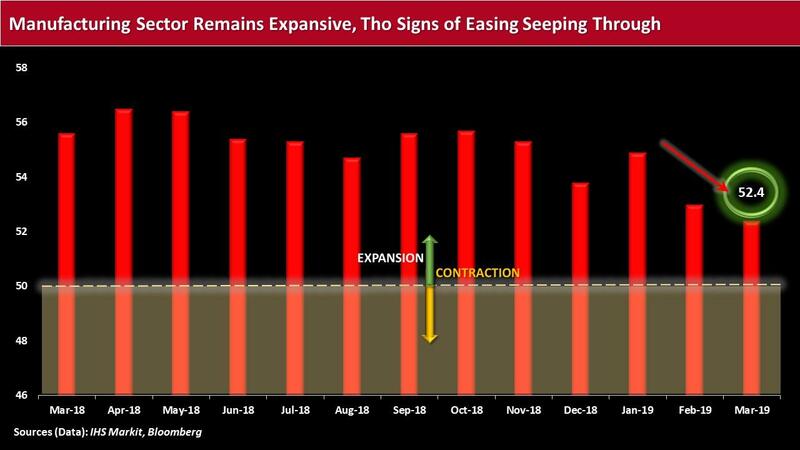 Fitch Solutions observed that there “appears to be a high level of uncertainty as to when a recession could strike. When the yield curve inverts – when long-term rates fall below short-term rates – a recession typically ensues. This scenario has included the past two recessions, which occurred in 2001, as well as from 2007 to 2009. 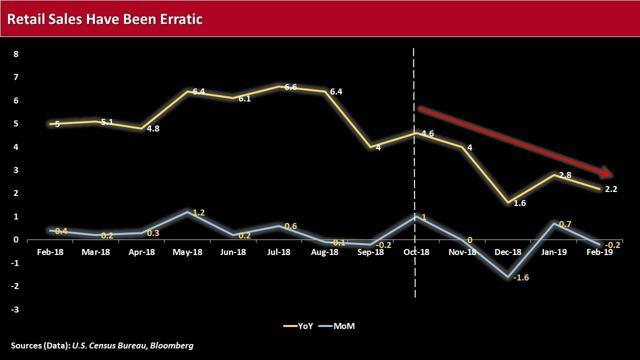 Since the latest inversion of the 3m/10y curve, which had reverted to positive at the end of March, investors have been busy speculating about the FOMC’s path of monetary policy normalization, and whether the two rate hikes that were once on the table for 2019 could end-up being a cut instead. Note: This material was originally published on IBKR Traders' Insight on April 12, 2019.